This Alesis Vortex User Guide is available as a PDF file. UPDATE 2013/11/7: Alesis posted a new firmware (1.20) and the Vyzex Patch Editing software on their site. I posted about the changes here. The new Firmware/Software combination kind of makes this page less relevant. I tested the manual programming of the new Firmware (1.20) changes. They are noted in their respective sections: Pitch Wheel, Pads. In the previous post, I looked at the inside of the Alesis Vortex. This time, I examine the messages coming out of the Vortex and look at the programming of the different switches and sensors. I decided to write this guide because I kept forgetting how certain buttons were programmed, and because as of this writing (2012/12), Alesis still hasn’t produced a detailed manual. Also because you have to reprogram the Vortex quite often, especially since there is NO way to know what is already programmed, and NO way to save the programs on a computer. Hopefully, Alesis will change this in the future. This colour is used to identify a word (or a series of words) as actual markings on the Vortex. The Vortex uses “patches” to store modified parameters. There are three “banks” of 8 patches. then each press will roll to the next “bank”)(the active Bank is indicated by a LED (A, B or C) and then chose a particular Patch by pressing a Pad button (P1 to P8). Note: When you select a patch, it can send a Midi ProgramChange command. I explain how to program this in the “And some extras…” section below. Each Patch contains all the modified assignments for every modifiable button and function on the Vortex. I still haven’t found a way to save patches on a computer. I still haven’t found a way to tell what parameter has been modified for a particular button except to go in Patch Edit Mode and edit the button. I still haven’t found a way to know which patch is active at a particular moment, except right after switching! So, I tend to use one or two patches at the most. Otherwise, I would need a pencil and paper to make a list (and tape it to the Vortex?). Not good. I’m guessing there must be a way to exchange SysEx information with a computer through the USB, but it is not documented. Normally, the Vortex is in PF (Patch Function?) Mode. In general, the Vortex is programmed by pressing Patch Edit (the display will show “PE”)(Patch Edit Mode),then by pressing a button/sensor. The display will show the button/sensor name (abbreviation) and you can then change the values. Pressing the Enter key (on the Keyboard itself)(Key #37) will change (store) the value. Pressing Patch Edit again will let you out of Patch Edit mode. Often, values can be changed by using the three knobs (potentiometers) aptly named K1, K2 and K3. If you end up programming the Vortex and just can’t figure out what you did, you can reset the patches to default settings by powering the Vortex off, then pressing the Start/Stop AND Patch Select keys and while holding these two buttons, power it back on. Hold it for a couple of seconds and release the two buttons. The LEDs will flash and all patches will be reset. The keyboard sends NoteOn and NoteOff Midi messages. The messages cannot be changed, except as noted in the next section (Keyboard Zones). This means that the keyboard cannot send CC or other Midi messages. There are two velocity messages sent by the keyboard: the faster you press a key, the higher the velocity. That’s the normal behaviour of nearly every keyboard on the market. What’s special here is that the velocity is also sent when you release the key. This is the first time that I see this. I have seen keyboard that send a NoteOn messages with a velocity of zero to substitute a NoteOff, and I have one keyboard that sends a velocity of 64 on NoteOff messages. But this is the first time that I see an actual velocity value on key-release, with a NoteOff message. I have no idea if I will ever need to use this. But I know it’s there. As with all keyboards, how hard you hit a key is not really important. Velocity is related to speed, not strength. But if you keep pressing on a key hard enough, you will engage Aftertouch. Aftertouch is force sensitive. The Aftertouch (AF) on the Vortex is Channel Pressure only. This means that the AF is applied to the whole channel as a global message, not to individual notes. This also means that even if you press more than one key, only one type of AF message will be sent. By the way, the AF engages after about 1/4 of a second. Also, the MIDI message for Channel AF is two bytes long. The AfterTouch message cannot be modified. Too bad. I would love to be able to change the velocity (or sensitivity) curve. With the default settings, the Vortex powers up in Lower mode. This means that the keyboard will send Note messages on channel 1 and that the lowest note on the keyboard will be C2. If you press Upper, the messages are sent on channel 2, and the lowest note is C2 again. If you press Split, the lower half of the keyboard will send on channel 1 and the upper half will send on channel 2 (split after F3)(or after the 18th key). These 3 buttons can be reprogrammed. Press one of the three buttons. Its name will show up on the display (“Lo”, “19” or “uP”). For Lower and Upper, three parameters can be modified by turning the knobs (K1 to K3). Transposition: Turn knob K1. The first parameter goes from -12 to +12. This will transpose the notes sent by the keyboard, one or more semitones at a time. For example, setting it at -12 will send a note that is one octave lower. Why would you do that, when you have dedicated Octave Down/Up keys? One good use of this function is when the keyboard is put into Split Mode (see below), You can then have the keyboard operate on non-contiguous octaves (or, even, overlapping octaves). This is useful in MusicLab’s RealGuitar, for example. Midi Channel: Turn knob K2. The second parameter is the midi channel (1-16). So, by pressing one key (Keyboard Zone) you can effectively switch the channel of the whole keyboard, or use two channels at the same time based on the Split location. Velocity Curve: Turn knob K3. The third parameter is the Keyboard Velocity Curve. The value go from 1 to 8 and if you refer to the Quick Start Guide on page 37, the nice (hand drawn) velocity curves can be applied to the Zone. I don’t know what the default curve is. I would think #1. Press the Enter key on the keyboard to save your changes. You don’t have to change every parameter. Note: By the way, pressing the Lower or Upper buttons in PF mode will send two midi messages: CC121 (Reset Controllers) and CC123 (All Notes Off) on the other zone’s channel. This is to ensure that you don’t end up with stuck notes in the case that a Zone change is made after a key has been pressed but before it has been released (Alesis must have caught that while debugging…) Notes: Firmware 1.20 removes that behavior. Vortex now remembers which note is pressed on which channel and will release that note on the proper channel. Nice bug correction! Split Point: When you edit the Split button, the only parameter to edit is the split point. Enter Patch Edit Mode, then press Split and touch the key where you want the split to occur (19 by default) and press Patch Edit again. As of this writing, the official Quickstart Guide is wrong. Pressing Enter or Cancel will only change the split to 37 or 36! These two buttons cannot be modified and don’t send midi messages. They just allow you to change the whole keyboard, transposing every key by exactly one octave (12 semitones), up or down. The Octave buttons will have the same effect when the keyboard is in Split mode, meaning that the WHOLE keyboard is transposed. So you can’t “freeze” one section. Too bad. That would have been awesome in RealGuitar! The Ribbon Controller sends midi messages. By default, it sends CC1 (Modulation). Press the Mode Assign key on the keyboard to alternate between two states: You can only change the behaviour of its release. It can be made to send a value of zero (or the minimum value assigned through the button (see below)) when released (the display will show “rn” (or ‘return’ I guess)), or it can latch (“Lch”) and keep the last value sent. The default action (“rn”) is the usual choice. The Ribbon Modes buttons (1,2 or 3) will change what is sent by the Ribbon Controller while in PF Mode. By default, button 1 will make the Rib send CC1 (modulation), button 2 will make the Rib send CC2 (Breath Controller) and button 3 will make it send CC3 (undefined CC). In Patch Edit Mode, pressing one of the three buttons will let you change four parameters. Press one of the Ribbon Modes buttons. The display will show “rb1”, “rb2” or “rb3”. press the Mode Select key repeatedly on the keyboard. You will have a choice between Control Change (“cc”), Pitch Bend (“Pb”) or AfterTouch (“AF”). Don’t forget to press the Enter key after changing the parameters to register the modifications. Note: The Range values are interesting. You can limit the range of values sent by the Ribbon Controller. I find it useful when doing Pitch bends, for example. I like my PB to be 2 semitones to 4 semitones up or down, so I set the range accordingly, with an initial CC value of 64 and a Max value of 128. The software on my computer does the rest. I can then assign another Ribbon Mode button to set the limit to something else or the Pitch Bend. Also, by setting the Max value to a number smaller than the Min value, you can reverse the action of the Ribbon Controller. Nice feature. Note: When the ribbon controller behaviour is set to “rn”, releasing the controller will reset the sent value to the MIN value set for the range. For example, sending a PB from 0 to 64 (instead of the usual 0 to 128) and releasing the controller will send … 0. But if you reverse the range (to create a reverse PB?) and send 64 to 0, releasing the controller will send 64, not 0. That can be used to create some unusual effect. Note: The channel assigned to the button can be changed right after entering Patch Edit Mode. Just press the Midi Channel key on the keyboard and use the numeric keys (1-9 and zero on the keyboard) to set the channel. Yes, redundantly, you can also change the channel by turning knob K1, but only for modes PB and AF. The Pitch Wheel cannot be programmed. It will send … Pitch Wheel messages (Midi Message 14). But the PW will send the messages on the same channel as the keyboard. Interestingly, it will send two pitch message when the keyboard is split. It’s logical, but will definitely send a lot of traffic on the Midi line. Don’t forget to pre Enter to accept the change. The Sustain button cannot be programmed. It behaves exactly like the pitch wheel, sending messages on the same channel as the keyboard. It sends CC64 (Sustain) with values of 127 when pressed and 0 when released. It will also send two messages in Split mode: one for each channel. No, not the Ribbon Controller, often called “the slider”. It’s the little sliding potentiometer near the Pitch Wheel. By default, the slider sends CC7 (Channel Volume). For the Vortex, it behaves like a Master Volume, not a Channel Volume. It sends on one channel only, even it the Keyboard Zone button forces the keyboard on another channel. But it can be programmed to send CC, Pitch Bend or Aftertouch messages, just like the Ribbon Mode buttons. Just go into Patch Edit Mode and move the slider (you might have to move it back and forth a few times)(the display will show “SLi”). Then chose Mode by pressing Mode Assign on the keyboard. Then refer to Ribbon Modes button programming technique above to modify the parameters. Of course, the “value” field of the assignment is variable and its value is determined by the slider position. … are in fact potentiometers (pots). In PE Mode, the knobs (K1, K2 and K3) are used to change parameter values when you program the buttons and sensors of the Vortex. They can also be programmed to send various Midi messages themselves, while in PF Mode. By default, they send CC21, CC22 and CC23 (all Undefined Midi CCs) on Channel 1. They can be programmed like other buttons by entering Patch Edit Mode and then moving the knobs. The display will show “nb1” for knob one, etc. They are then programmed like other buttons (see the Ribbon Modes buttons section above). The Start/Stop button sends Midi Start or Midi Stop messages (Midi Real Time Message, values 252 or 254). It can be programmed to send CC messages instead. It will then send the CC message with a value of 127 when the button is pressed, and a value of zero when the button is released. In CC mode, the knobs are used to enter the CC code that you want. The button can send ANY CC code. So you can use it as a CC sending button that has a LED showing its state. Nice feature. Note: When in CC mode, one press of the Start/Stop button will send the CC number set by knob K1 with a value of 127. Releasing the Start/Stop button will send the same CC number with a value of zero. Pressing the Start/Stop button again will do the same thing for the second CC number, assigned by knob K3. Note: When in CC mode, the channel for the Start/Stop button cannot be changed and is linked to the channel of the keyboard, like the Pitch Wheel. So it will also send two messages when the keyboard is in Split Mode. The Program Down/Up buttons cannot be programmed. They can only send a Program Change Midi message (PC, code 12) on channel 1 (not modifiable see below), in sequential order. The program number is shown on the display. This is a two-byte midi message. Those keys are quite useless if you have a lot of program changes, unless you never jump to a particular program. Note: in firmware 1.20, the Program Change will be sent on whatever channel is chosen on the Keyboard. That includes sending 2 PC when the Keyboard in in Split mode. Nice work, Alesis. The Pads (P1 to P8) can send a variety of messages. They are a key feature of the Alesis Vortex. press the Pad (P1 to P8) you want to edit. Each of the parameter types (Channel, Mode and values) can be edited separately. If you don’t edit one parameter type, it will retain the previous value (which you have no way of knowing, by the way)(unless you use MidiMonitor on the Mac or MidiOx on the PC). The display will show its number (like “Pd1”). press the Enter key at this point to save that channel. press that Pad again to program the codes and values. Panic Mode: (new in Firmware 1.20) Displays “pnc”. Sends an All Notes Off, (Midi CC command decimal 123) on all 16 channels. Very useful. Turn knob 1 (K1) to chose the note (you knew that there were 128 notes in Midi, right? )(So you must KNOW the number for each note, right! )(No, you can’t just press a key on the keyboard to assign its value to the note. The program would have no way of knowing which octave you’re in)(or wouldn’t it?). There is room for improvement here. Turn knob 3 (K3) to chose a Velocity Curve (nicely hand drawn on page 37 of the Official QuickStart Guide). Remember that this knob is useless if you chose anything else than zero on knob 2. That’s it for the pads. They are a (relative) pain to program, but very flexible. The Accelerometer (“Accel” for short) is stuck inside the Vortex. But there is a LED (the only green one! )(right next to the display)(it’s called Tilt, for some strange reason)(maybe the guy at Alesis played a lot on pinball when young) that flashes when the Accel is activated. By default, the Accel is activated whenever the Vortex is tilted more than 45 degrees from horizontal with the left hand UP (it’s called “the neck” in the Official QuickStart Guide). It can be programmed to act differently and also can be programmed to send other Midi messages than the default CC1 on Channel 1. By the way, it doesn’t matter if the Vortex is flat on its back, in normal playing mode or upside down. The fact is that if the left hand is above the right hand, the Accel will eventually get activated. Press the Mode Assign key on the keyboard. The display will show “cc” for Control Change, “Pb” for Pitch Bend, “AF” for AfterTouch or “oFF” for, well, Off. Note: If you use CC, keep in mind that the values entered are for minimum and maximum. This means that if you set the minimum to 5 and the maximum to 6, for example, the Accel will alternate between these two values only. Note: If you set the minimum position too close to horizontal, the Vortex will send Midi messages pretty much continuously. But you can, if you want. You can even set it to a point BELOW horizontal. Note: if you set the CC to alternate between two values, by choosing number X for minimum and X+1 for maximum, the Vortex will act like a momentary CC trigger. It will alternate based on the range that you calibrated. Nifty. Note: You can, of course, reverse the action by choosing a Max value smaller that the Min value. Sending a Midi ProgramChange when selecting a new Patch. I prefer to use Pad assignment to send PC commands, as I only use one or two Patches on the Vortex (because it lacks Patch Exam functionality). This entry was posted in Vortex and tagged alesis, midi, Vortex. Bookmark the permalink. Hi! Thanks for the info, excellent! Quick question – When programming the Vortex in Live, the midi mapping seems weird. It saves all mapping for the K1 K2 K3 buttons, but seems to ‘forget’ the ribbon and accel assignments? Any ideas? The only thing I could find was that Ableton itself will forget the mapping if you don’t save the set. Try that. Knobs K1-K3 use standard midi CC messages by default, the the ribbon and accel use different assignments that are not standard in Ableton. By “not standard” I mean Ableton does not assign those to default controls. Ive saved the set, and when I use midi mapping it works fine, but if i change patch on live then return to the one I just saved, thats when the ribbon and accel stop working, until I assign them again. In the midi mapping folder, are the assignments still showing? Many, many thanks for taking the time to do this. You have no idea. Well, yes you do, otherwise you wouldn’t have done it for the rest of us. udaman. We conducted a number of settings that you restart the vortex, they were totally forgotten. So all stored functions are forgotten at restart. Can someone help me in this regard? The lack of sysex in the Vortex is inexcusable. Hopefully, before too long we’ll be able to take the tech sheet of the processor and enable a sysex dump from an external PC. Until then, I just use Midiox from http://www.midiox.com. With the Vortex connected through USB, and my KORG N364 connected by 5-pin MIDI through a legacy cable to the gameport of my P4 computer (we’re talking old here), any control change made to the Vortex reads out on the computer screen while it is routed out to the KORG. That makes it very easy to keep track of what’s mapped to what. Take the computer out of the signal path and go play – and hope you laid out your programming logically enough that you can remember it. I’m using Midi Monitor (www.snoize.com/MIDIMonitor) on the Mac for the same purpose. I’still haven’t heard from Alesis about the SysEx or other dump function. “F0 7E 00 06 02 00 00 0E 35 00 19 30 31 30 33 01 7F 7F 7F 7F 7F 7F 7F 7F 7F 7F 7F 7F 7F 7F 7F 7F 7F 7F 7F 7F F7”. Ignore the “F0 7E 00 06 02” (it identifies the string as a Sysex response to a device inquiry). The next part is “00 00 0E” which is the manufacturer ID (“alesis”, of course) followed by “35”. That byte is the ID of the Vortex. The rest is unknown data, but I’m guessing that the “30 31 30 33”, which corresponds to characters 0103, is the firmware version number. That’s all I could extract. Also, on the same page, at the top, I understand that the Vortex is supposed to recognize incoming Midi communications for Midi Channel, Note Number and Program change(1-24). The first two don’t really make sense, although a short comment is present “Lights pads assigned to note numbers” which makes me believe that sending the right note to the Vortex should light a corresponding Pad. I haven’t been able to make this work, but it would be funny to see (somehow!). The next line mentions that the Vortex is supposed to recognize incoming Program Change when in the range 1-24. That lets me suppose that I could remotely change a Patch number (to load it as the active patch). I have not been able to change the Patch using this. Maybe it doesn’t work. Someone else wants to try? Finally, there is an error on that page: on the “Note-Off Velocity” line, the documentation states “No”, but I can confirm that the Vortex does indeed send the Note-Off Velocity. Updated: The new firmware (1.20) let’s you change patch content from a connected computer. Please read my complete post. Hallo, I have a question…I wanna buy the Alesis Vortex to connect it via CME Widi, wireless midi, to my Korg PA3X arranger. Will it function, so I can control the paerformance and tone changes directly form Vortex while on stage? The Vortex has dedicated Program Change buttons that will send the proper commands to your PA3X. I think that tje PA3X responds to a combination of Program Change and Control Change to select sounds. The dedicated buttons on the Vortex are not very good though. They often send more than one PC command and can only go through PC sequentially (although keeping your finger on a button will eventually start counting by 10). But the “drum” pads can be programmed to send Program Change commands for direct access. That’s what I use. Also, my wireless unit is programmable and I can use it to generate program changes on any key. But yeah, it will let you control quite a bit of stuff from the stage. The Vortex does have “transpose” keys, right next to the Touch Strip, above the 3 keyboard assign buttons. They shift the whole keyboard one octave up or down at a time, from -3 to +4. The keyboard can also be split in two. Can you use an expression pedal with the Vortex? If so, any recommendations on one? Hi! Is it possible to save vst instruments in the vortex and play after without computer? The Vortex cannot produce a sound. It also cannot store anything sent from a computer. Fantastic! Thank you for taking the time to do this. The Vortex isn’t the best but it’s not bad for the price! Do you have any idea if the pitch bend wheel can be programmed to reverse it’s current polarity? I feel like pushing it away from the keyboard is up and I want to the pitch to go up. Right now, pushing it in that direction bends the pitch down. I know I can get used to it but just seems more intuitive to me reversed. The Pitch Wheel cannot be programmed. Nothing can be modified. You will have to use an external processor to reverse the Midi commands. It could be programmed into a micro-processor easily. It could also be done on a computer with readily available software. You could also use use the Ribbon Controller as a Pitch Wheel. It is programmable and its action can be reversed. Updated: The new firmware (1.20) will let you do this! On my Alesis Vortex, if I hold “sustain’ button , then press and hold the A key (A2), the program change message is sent randomly. Do you have the same problem with your controller? No. Mine does not have that behaviour. I wonder how that’s possible! Hi! I have the same problem when using my behringer midi pedal fcb1010 and connecting vortex to its midi in and then merging the midi messages from the pedal and vortex to my korg midi in via the pedals midi out. When I press the pedal(program change) and press sustain or use the pitch wheel, the program change message takes the program change number from the sustain or pitch wheel midi messages. I will try to use different midi channels somehow, it may solve the problem. The FCB1010 doesn’t really merge MIDI messages well. It merges MIDI feeds but doesn’t do intelligent merge. Since Pitch Bend and AfterTouch come out of the Vortex using Running Status (other commands do that too), the FCB1010 is not programmed to re-insert missing information in the MIDI stream. Using different channels might help but I would have to test it. I would personally not plug the Vortex into a MIDI equipment chain because it’s impossible to de-activate Running Status. I was wondering if MIDI-solutions products could help me out here. What is your opinion, does their midi merger do merging “intelligently”? Then I was also wondering if I could use their midi filter so that I would filter everything “not wanted” from a certain midi channel. For example program change values above 40 and all the necessary control change messages. I haven’t tested the Event Processor Plus but I think that it would do all that you need. Send them a line. This was so helpful. The ribbon button control section especially. My Yamaha CS6x has a ribbon and mod wheel that both can be used in some voices. Being able to use the ribbon buttons on the fly for different cc’s is great for wavetable sounds. I still wish Alesis would have included midi song select function since they included a start button. What are the practical applications of the Patch Select function? I’m currently using my Vortex to control Ableton and the MIDIvampI synth. Since you can change the assignment of pretty much every button and control on the Vortex, it can be practical to have more than one “series” of assignments. the “series”, on the Vortex, are called “patches”. The Vortex can store 24 different patches. Since it’s impossible to review patch content, most users only program one (maybe two). So the “patch select” function is quite useless in real applications. Since you’re also using Ableton, you can reassign the incoming midi signal to whatever you want inside the software, effectively making patch selection redundent. I just use one patch now, and use my own midi-processor to dynamically change Midi commands on the fly. It was a dumb question. What I meant to say was program select, not patch select. What are the practical applications of the program select function? The “program UP/Down” buttons are actually quite useless with Ableton Live since it does not natively respond to Program Change Midi commands, sent by these buttons. Same goes if you assign Program Change commands to pads. If you work on a Mac, you could purchase MainStage, which works well will Program Change (and with the Vortex in general). I use MainStage as a sound generator for audio tracks in Ableton because of some Ableton limitations (notably what is explained above) and because I prefer some of the sound banks available in MS. Also, for $30, it’s definitely worth it! All the info you provided is great. Its been very helpful. I am currently using the vortex with 2 synths at the same time via midi thru,in and out. It works great. Is there any way to reverse the keyboard zones. Only one of my synths has the thru function. I have a korg m50 and a Roland phantom. I would like to switch the keyboard on the low keyboard zone to hi, and vice versa. Is this possible. I’m sorry, but I don’t undestand what you’re trying to do. Hi! Really thanks for this post! I’ve just bought the Vortex and learning Mainstage. You pointed the use of RealGuitar, so I would like to use RealStrat and RealLPC whith it, and I can assign a different sound (mute string, chunk…) to a midi note on RealStrat/RealLPC. I don’t want to use my left hand for pressing the keyboard and change the sound to ‘mute string’ while playing chords whith the right hand, so I really was thinking: there is a way to send a midi note with any of the buttons on the Vortex’s neck? I’d like to assign a midi note event to a button, like sustain, ribbon, ribbon mode button… Do you know a way to obtain the result that I want changing anything on RealLPC or Mainstage? Thank you Robert. This is very helpful. 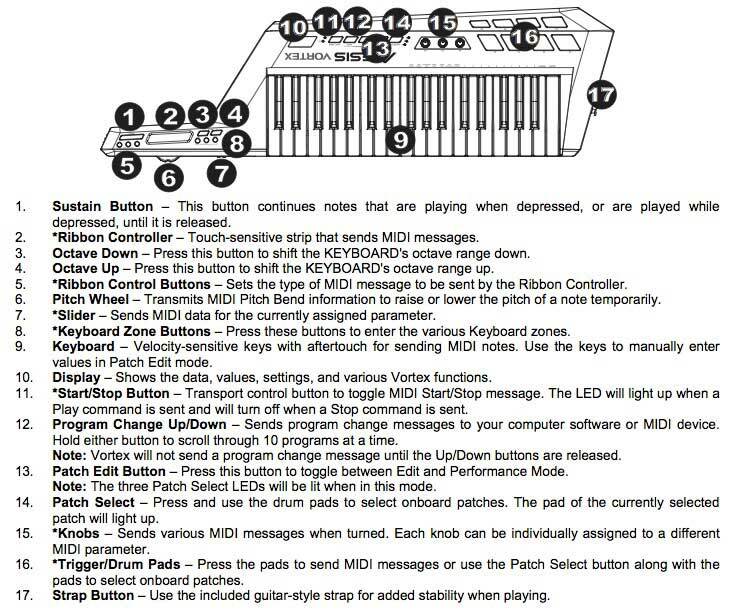 Alesis should be ashamed of their manual. I would love to use Vyzex Vortex. I downloaded the firmware update but the Alesis website will not allow me to download the Vyzex software. I am so mad. I use mainstage on my Mac so it is good to know that will work well. I had wondered if I could use both the usb and midi connections at the same time to trigger both soft synths and some of my hardware. Since the Vortex came this afternoon I was able to test that and Yes it does work. I also had wondered if my Macbook would power the Vortex and that also works. Your manual is a god send. I am so grateful. It has been a while since I have had to work very hard with a piece of gear and the Vortex takes some work especially without a decent manual. Now I have a chance to actually get the acc to work. I am wanting to use it for volume control. Perhaps some time I will find a DIY article on building my own expression pedal. The Vortex took the whole years fun money. Well you know money has been hard to come by so I only get $10 per month for fun. After all every once in a while a want has to be satisfied, not always just needs. Again thank you so much. I am most grateful. Pray that Alesis fixes the link or what the heck ever is keeping me from getting the Vyrex Vortex software. I also had wondered if my Macbook would power the Vortex and that also works. It can also be powered by an iPad. I also tested it with an iPhone, using an IK Multimedia “iRig Midi” device, on the Vortex’s own battery power. I am wanting to use it for volume control. Perhaps some time I will find a DIY article on building my own expression pedal. You can use the Slider (S1) for Volume Control. It is programmed as CC 7 “General Volume” by default. The Ribbon Controller can also be used for Volume Control. I use it by programming Riboon Modes Button 3 to send CC 7. There are many good DIY articles for building your own Midi Volume Control. I usually use micro-controllers for that. I will soon post an article about building a wireless Volume Control. You could also use next year’s “Fun Money” to buy a Behringer FCB1010 pedal board and really expand the Vortex’s versatily, especially with MainStage. I will have a Post on this soon. Would love to go wireless. I can solder etc and have a nice soldering station. But do not have any circuit or that kind of electrical knowledge. I can wire a house too but that electronics stuff leaves me woozy. I am hoping to eventually find a kit or a good diagram and parts list so I can go wireless just because it would be fun. Former pro player but health issues have forced me to retire to mostly poverty. No complaints, I am still alive and kicking. I may sell some of my keyboard gear to finance other keyboard gear. Former drummer but now play keys and mangle my time at an acoustic guitar! Your articles are very nice. I am grateful to have found them. I got an email from Alesis and I have the software now. I will try and update the firmware etc. If it does not work using the mac I will run up windows and use that. You have done what Alesis should have done. I do want make one of the ribbon presets do volume. The volume slider looks pretty wimpy and I could wear it out in no time. But eventually an expression control would be the best solution. But since I am back to being a music hacker things have to come when they can be worked in to no budget! I will post an EASY circuit soon! had to start beathing again but still looking forward to the how to wireless midi! M-audio midair has been discontinued for a few years. Still available sometimes on eBay but it didn’t get good reviews anyway. Very cool. Looking forward to that. Been kinda lost lately maybe this will help me move forward. Just updated the Vortex using my Macbook. Worked perfectly. Not sure why it did not work for you on the Mac. Thanks for the tremendous effort you put into this AWESOME document. I purchased the Vortex on an impulse and received it about 2:30 this afternoon. I’m the proud owner of a Korg original Oasys Card (and yes I have to keep a dedicated industrial grade Window’s 98 PC with no network interface). It’s still one of the most awesome tools in my rack and really requires an excellent controller keyboard to get the most out of it. I’d honestly given up an a “Keytar” for control. When I opened the box I went through the packing material twice looking for the MIDI implementation. I was very disappointed when none was to be found in the box or on the Alesis Website. Finding your documented efforts made my day. I felt as if I’d been rescued 🙂 Thanks again. Thanks. I like when someone finds this useful. My issue is the sound. I downloaded the firmware, I change the USB cable, used different kinds of ports, I downloaded the free SoniDVI and the software works all the knobs are working, even the piano image when I press the keys can hear the sound. All the lights lit like the P23 showed on the display. What am I missing here. Please advise its been a week now and I just found your well organized website. I did not get any response yet from Alesis I am getting disappointed already. What OS are you using? If on a Mac, you can test in GarageBand also. If on a PC, you have to find out if the Midi signal gets in. Do a search on Google for Midiox. Once we get confirmation that Midi is getting in, we can configure the software. First of all you are a big help to people like myself, help you can not get from companies whom you invested your hard earned money. I will tell you now, I can feel the personal touch you expressed to every questions delivered to you. 2) I forgot to mention to you that I installed the Vyzex software a patch editor that comes with the vortex, as I thought that the Vortex needs it to run. I already downloaded the MIDIOX. Since you already have MidiOx, can you tell me if Midi commands coming from the Vortex are shown? And since you have Vizex, does it communicate with the Vortex? In the midiox the windows says no output device REC and SYX highlighted and the MAP KYB LOG is not. In the lower left it says No Output device. Since you wrote that you tried a different USB cable, this looks more like a hardware problem. First, look into Windows Device Manager. Is there a yellow question mark next to one of the USB devices? That would mean a Vortex problem, especially if you already have other usb devices that work. When I checked the one you told me about the USB it was not there, I saw it on the sound, video and game controller section, nothing on the USB port. I tried to use my old computer with Win 7 everything is in place except that patch says loading to vyzex is not going to happen I gave a good 45 minutes and nothing is happening just say loading seems they can not communicate. the sample contents and vyzex looks like not talking to each other. whew! Do you have a regular midi interface? If so try that. Just a thought. another thought, does the usb power the Vortex? If it does and they do not communicate I would suspect the Vortex has some other problem….Especially if you can try it with a midi interface and it does not work as well. Thank you for the concern, I do not have any midi interface. Yes, the USB give power and one thing I noticed is when I press the keys the blue lights located in the neck blinks at the same time. so there is a connection except for I guess the factory patches is not loading to Vyzex. Tried the troubleshooting sometimes the patch is initiating and stayed there and one time is loading but also stayed like not responding. Also I noticed that the folders of every sample patches is like an empty folder. Thank you, hope have an idea regarding this issue. I do not know about the lights blinking. Mine does it too, not sure why. I put tape over the lights so as not to blind some one else…Besides it makes me look like some kind of Christmas tree ornament. The empty folder is normal, you have to create your own and since it does not know what you have…. Wish I had better thoughts but… Of course the Vortex has no sounds of it’s own, it is just a controller. But if your computer will not talk to it you can’t trigger any sounds anyway. Time to get a warranty replacement! I assume you were not able to get the firmware installed and so the vyzex would never work without that update… do you have something with sounds in it that you can trigger? Or do you have a DAW with software instruments? Might try it there and see if it works. Just trying to think of any way to get something from it because then we could work with it. But it does sound like it is a hardware issue with the Vortex at this point. The Sonivox DVI that comes is installed and the piano image with keys in it works. every keys I pressed there has sound. the knobs works too and the patches are visible too. but as usual there is no sound when it comes to vortex,. The Vortex has no sounds! It is only a controller. You can push keys till you die and it will not make any musical sounds, just the sound of you pounding the keys….If you are expecting the Vortex to MAKE sounds you will forever be disappointed…. I know it is only a controller and not a player. it is not like a guitar that you plug and play. Since this is my first time to use a hardware such a this, that is why I considered myself in the innocent stage. I will let you know just in case I found a solution from other helpful people like yourself and Robert, so it will be added to the knowledge base of this website for future users. I believe it is more on software issue than a hardware. did you get the firmware update to work? I installed the software yesterday. Someone from Sonivox asked for a certain driver which I do not have. I emailed him maybe I will get an email back tomorrow. I will let you know. How hard is this keyboard to get to grip with. And the manual is very poor. Do you know how I can get I think cc2 to work on the ribbon. For eg im playing through a korg tr and when you pull down towards myself the joystick it changes the sound ie adds feedback or plays an effect. I could do this with a roland ax1by sliding the ribbon it would tap or play the desired change but I cannot get this to work on the vortex. I don’t know if I’m just an inept reader or if I’m just too inexperienced with MIDI to understand how to.. understand. Agh! So I’m in a fun pop-rock band and we decided to purchase the Vortex for many reasons- the most important being the ability to change MIDI voices on stage from the instrument itself. With each song using a mixture of synth leads, synth pads, organs, what have you, it’s just too much of a hassle switching the voice on my laptop each time. Well I’ve had this bad boy for a couple of months now and STILL can’t figure out how to control this from the controller itself. I think I read in this thread you can do it from the drum pad buttons? Oh man, I sure hope so because I’m starting to lose my cool over here. I’m literally losing my cool, I can’t look cool with a keytar if I have no idea how to control the darn thing! As watered down and layman’s termsy as possible, HOW IN THE HECK DO I CHANGE THE MIDI VOICES FROM MY CONTROLLER?!?!?! I gave up on Ableton, it made me a very scary person. I’ve been gifted Logic Express 9 though I of course have no clue what the hell I’m doing in that program, either. Oh man. I need a mentor for this stuff, I feel so stupid at this point. Then, you have to make the Vortex send that particular Program Change. Use the Vyzex Vortex application to assign this Program Change to a Pad. I’ve just published a short video to show you how to do it. How do you changes VST sounds from the Vortex with Ableton Live? 1. Create different tracks for each VST instrument. Midi map the pads on the Vortex to arm each track. Use the pads to turn on and off the individual tracks. 2. Create different tracks for each VST instrument. Assign a different midi channel to each track. Give each patch on the Vortex it’s own corresponding midi channel. Use the patch select button an the pads to select different VST tracks/midi channels. Each method has its own pros and cons. I’m not sure if there is any way to get Ableton to respond to program changes. I can elaborate on these two methods but I’d like to hear if anyone has any other work-arounds. Cheers! Could you elaborate on this? I can’t figure out how to change a track’s MIDI channel. Any idea if it’s possible to use GarageBand in the same way? I’d buy MainStage, but I can’t upgrade my Mac to be compatible with it because I use iTunes 10 for my band’s tracks/setlist (we use cover art and CoverFlow to display the upcoming song’s title, key and BPM). Thanks bud its helped me lot. But still struggling to get the damn thing to do what I want.. good job im only using it for a few numbers..just want to say im very dispointed that the manual is very poor shame on you alesis snd their online support is equally poor. Ive tried to get it to pull a sound with the pad and am struggling..also trying to get the ribbon controller to work the same function as the korg joystick for eg if I pull the joystick back it will make the sound feedback I cannot get this to work on the vortex. Think it us cc2. Would anyone be able to advise.. sorry if im being thick. Use the Vyzex Vortex software to adjust your cc numbers for the pads sliders ribbon etc. You have to remember to send the patch you adjust back to the Vortex once you have made adjustments and you will see a small reminder of the at the top of the left hand Vyzex column if memory serves me correctly. Find out what cc number the Korg joystick work on and then use vyzex to change it on the Vortex t match that. Then send the patch back to the Vortex and it should work. I also suggest you make a back up of the full factory settings so you can always go back if need be and then a copy of your customized setup. Thanks for all of this great information. I have recently bought the black wireless Vortex and I’m trying to work it out. I have my Vortex plugged into a sound module (JV1010) and I’m trying to work out how to quickly switch between different instruments. At first I thought that I could only have 22 different instruments set up (relating to the 22 patches available on the Vortex). However more reading makes me think I can actually do 22 x 8 (8 being the 8 pads available). Is this correct? Theoretically, if I played 22 different songs, could I set up a patch for each song, and each song could have 8 different instruments assigned to each of the 8 pads? I’m trying to get my head around how this all works. Your calculations are right. 22 patches with 8 assignable pads each. That’s a lot of different instruments to remember! Problem description is a little vague. Did you try a different USB cable? I want to assign program change to Ribbon Controllers 2 and 3, I have my preferred patches setup next to each other and i want to browse through them using my left hand on the neck without using the program changes. is that possible? Hello, thanks for this guide. It has been very helpful. I need to assign the function of the Accelerometer to be controlled by the slider. How might I be able to accomplish that? Hello, Thank you for this excellent guide!! I’ve had the original Vortex for about a year, updated the Firmware and it has worked great with no problems. Two months ago, I purchased the Wireless version as well. I did not thoroughly test the new model, It seemed to work fine, and I was only using the Pads at the time. It wasn’t until trying to perform with it that I noticed the Sustain light stays on and constantly sends on/off messages. The display also always shows the 3 bottom LEDs lit as if sustain was pushed “_ _ _”. I thought this was just a ‘feature’ of the new device. I have replaced the batteries, run via usb power, ‘cleaned’ the sustain input port to no avail. I am hesitant to call this a hardware problem, because the button works fine when any of the key from the 1st Ab to C# are pressed..!!??!! I wouldn’t be surprised if something was defective. I’ve been through three Vortexs. The first one had a cracked key. The second one, the USB receptacle straight fell out into the casing. Now this third one glitches out right during a soundcheck and wouldn’t send any data at all and it took me reinstalling the firmware to fix it after the show. No question they’re cheap. InMusic took my second one under warranty and can’t replace it until October. I’m still working with them after months to fix this. Hi Alex, thanks a lot for your useful hints! So far I achieved this using method 2. Could you please give more details about method 1? What kind of message should the pads send to turn on / off the individual tracks? Some day Robert will publish a guide to how to make your own inexpensive wireless midi. He said so in december and I have great faith he will find the time to do so soon. OK then, I promise again. Soon. Actually, it’s right here on my desk. Just need to do the schematics. I’ve already published the program (arduino) I think! This wasn’t inexpensive ($300), but I tried a cheaper wireless midi from M-Audio and it was basically worthless. For $200, you could just buy the new Vortex…I haven’t tried the new Vortex, so I couldn’t say how its range compares to the AirPower. If I had the dough I would get a new Vortex or even a Roland keytar or a nice midi unit. Sadly you have to live low when you get older and sick and take nothing from the government. I qualify for everything but I will not invite them into my life like that. I pay the price and pretty soon I am going to pass on because I have heart issues that get no attention. No complaints, I did it my way. I have already lived over twice as long as I thought I would make it to 30 maybe. If you win the lottery, think of me ok? I’m going to try out a new idea…mounting an iPod touch in place of the drum pads (I actually took them out) and using a standard wireless instrument system with it. Not as much flexibility with the Sampletank sounds, but at least they’re accesible and visible directly on the Vortex. I gave up on trying to get Ableton working with both keytars…I couldn’t figure out how to get Ableton to recognize each Vortex (and Air Power) as separate devices…changing the MIDI channel didn’t do anything. We are cool. I know you will do it when time permits. No pressure (ok a little). I do really want to go wireless with my Vortex…. It would be much nicer than the usb cable tether I have now. But this stuff has to work for you. I do very much appreciate your contributions to the world of musical endeavors.. Finding your website was a huge up day. As is the news that the project is not forgotten. Have the best possible year…. And thank you so much for ll the wonderful things you do…. I have the Vortex and am really starting to get into with regard to programming so I can use it live in my show. I have a custom guitar patch on my Korg M50 that I am triggering from the Vortex and I have set up the keytar so it will work with that patch. The problem is that when I turn the unit off, it seems to forget the changes I have made to it when I turn it on again. In fact, when I go assign the ribbon controller again (as well as the slider for volume) it fails to keep the changes, I have to reset the keytar and program it again from scratch. I have set up the keytar to transmit on MIDI Channel 2 instead of Channel 1. All of my songs have the lead patch on Channel 2 so it is consistent in my rig. I see that there is someone else who has had this problem as well. Once I reset the keytar and re-program everything it works until I turn it off again. This is not going to work well on stage if I have to reset the keytar, and re-program it again every time. I have tried to make the Vortex forget it’s midi assignments when I turn it off but every single time, it will power on with the last changes I made. How do you do the Vortex programming? Do you do the changes with the Vortex unplugged (on batteries)? Is the Vortex plugged into the M50? Are you certain that the Vortex forgets the changes? One way to be sure is to plug the Vortex in a computer and actually look at the midi commands sent. On a Mac, I use MidiMonitor. But any midi device capable of showing incoming midi commands should do. What I would do is: on batteries, change a midi assignment on the Vortex. Plug it in a computer and verify. Unplug the Vortex, turn it off. Plug it in again, turn it on and check if the changes were lost. If they were lost, then the Vortex is reseting itself on power on. That would be a definite problem with your unit. If the Vortex keeps the changes, then the M50 is confused and does not recognize the Vortex properly. I decided to try to program the Vortex with one update at a time. I first reset the Vortex and brought it back to factory specs. After doing so, I changed the Lower MIDI Channel to MIDI Channel 2. I saved the setting, turned off the unit, turned it back an and it kept the change. I changed the Slider to work on Channel 2, saved it, and turned it off. After turning it back on, it remembered that. I edited it again by hitting the Ribbon 1 button and changed that to MIDI Channel 2, saved it, and returned to Performance Mode and it worked 🙂 I simply have the ribbon sending CC 1 information (modulation) so I don’t always have to ride the pitch bender to make vibrato. I turned the machine off and then back on and it forgot the ribbon setting but remembered everything else. I can see the numbers in the display on the Vortex rising as I rode the ribbon higher but it did not affect the sound at all. I am doing this with the batteries (which are new) and not plugging the unit into USB or ac adapter (what good would an adapter or USB be if I am using this as a simple remote keyboard?). I do not use my computer for any MIDI communication at all in my studio so plugging my Vortex to my computer would not help me at all. I would also assume that since the unit appears to have remembered most of my changes that it actually works. While I am making my changes, the Vortex is plugged into the M50 and it too is on so I can verify that the changes work. Nothing seems to be out of place on the M50. With regard to the Korg getting confused, I do not think that its the issue either since again, it responds to the pitch bender information, aftertouch and the volume control (from the Slider) from the Vortex. I believe that the issue is strictly with the way the ribbon has been set up. All I want to do is use the ribbon to modulate vibrato on my guitar sound. I have gone into the sound itself on the Korg M50 and adjusted OSC 1 so it too responds to aftertouch so when I press down on the keys on the Vortex, I get the modulation I was looking for. It would be nice to have it coming from the ribbon, but it is certainly a work-around that will work until I resolve the issue. I am simply using this as a simple controller for my Korg M50 on Channel 2 on all of my songs to trigger a custom guitar patch that I have made. I am using the full keyboard for the one sound (so I am not even sure I am programming the Lower/Upper/Split thing right because I am not technically using it in that mode; just full keyboard and so I thought I would default with the Lower using the MIDI channel I needed). I do not plug my unit into the computer to control soft-synths or anything, nor do I use the software that came with the Vortex. I just wanted a simple and dirty keytar that I could use to play live with and since it was selling new for $99 at a Guitar Center when I lived in Texas, I thought it a “no-brainer” to pick one up. I love the guitar sound I made on my M50 and being able to “keytar” it while playing live is really neat and another way to maybe get to know the crowd a bit better when I play. I used to use an old Korg RK-100 back in the 80’s when I was playing and while heavy and no velocity, it was a blast and worked so well hooked up to my old Korg Poly-800 and Roland Synth-Plus 60 synths. My live rig now consists of the aforementioned Vortex and Korg M50, Korg X5DR, Ensoniq VFX and SQ-R, Roland JV-880 and M-SE1 and a Yamaha TX1P. I am also getting another Korg in the mail today; an 05R/W. This will also become part of the live rack and I will likely be triggering this from the Vortex for leads (in addition to triggering the custom guitar sound I made on the M50. The other rack gear is simply being triggered by the M50 to provide layering support from the sequencer). Thank you again and I await your response. I have programmed my Vortex using the exact steps written in your comments, and mine keeps the ribbon button 1 channel assignement. I can even program the whole thing in one go, without having to turn the unit on and off between each step. The only special thing I saw was that when assigning the channel to the Ribbon Button 1, I had to press 2 twice because it chose channel 12 on the first press (from channel one). Make sure that you see 02 on the display before pressing “Enter” to save the change. I have tried it multiple times. I’ve noticed this as well and made a appropriate changes to make sure it is on Channel two. This also seems to be having the same issue with other synths in my arsenal when using the Vortex to control them. Since the pitch wheel is constant no matter the channel, I simply use the pitch wheel as a vibrato source and modulate it while playing, like a guitar would bend the strings while playing. I was just hoping that I could use the modulation from the ribbon instead or use it as an alternate source. I am actually using the Vortex to control two different synths but with different parameters. The Lower section is of course, on Channel 2 but I have changed the Upper section to Channel 16 to control another synth (Korg 05R/W). Even when assigning the ribbon for that channel in the Upper setting, it still does not work. I have made sure that the appropriate settings within the program are turned on but it still does not work. I suspect that there may be a problem with the Vortex but since I have a work-around and the fact that the synth is over 6 months old, I will leave it as is and use it with the work-around. No worries. Thank you again for your replies and for the site with all of the great information. I want to set a fixed velocity, less than 127. For example 95 … Is it possible? How? Thanks and I really appreciate what you do for users Alesis Vortex! You can’t do it in the Vortex itself. What is the vortex connected to (what generates the sound)? The sound is generated by the Kontakt 5 . I’m trying to figure out how you can calibrate the trigger pads. I practically have to hit them hard with my finger or it does not make a sound. I have a KorgPadKontrol and I enjoy how touch sensitive it is. I can hit the pads and make noise without much effort. But with the Vortex I would never play it live because I can’t get a response out of them sometimes. I have to hit them hard and sometimes they play like I hit them multiple times. I was never able to use the Pads for drums or similar hit activities. Oh my God, if someone knows how to calibrate the drum pads to make them easier to hit, then you’re a hero. I don’t understand who would put together a device with trigger pads on it, test it out(assuming they would test the hardware for problems), and not make changes after finding that there are very noticeable problems with the way things work. They could have spent less time making this thing look all flashy with LED lights and more time actually making features work. As a buyer, when I see that a piece of music equipment comes with triggerpads I just assume they work. I shouldn’t have to second guess that. Does anyone else have issues with the ribbon/accelerometer being rather finicky? I’ll be playing and randomly the accelerometer bumps itself up. I’ll slide my finger down the ribbon and a few seconds later, it bumps up again. I noticed it happens more often when I’m playing the F key, though I’m sure that’s points me towards a mechanical error. It happened during a live performance recently and was really throwing everything off. Should I send it back or is there something I’m not doing I.e. Cleaning properly, programming, etc? I have calibrated my X, Y a few times thinking it was the problem but it doesn’t seem to be helping. Go into your vyzex vortex and go to pads. each one shows as midi channel 10 so change them to the channel you want. The rest Robert will have to explain. Anyone else had this issue? I’m using Ableton Live as a sound bank and I’ve assigned the MIDI controls to enable record for each track when I press the corresponding drum pad on the Vortex. It works great when I plug the Vortex directly into the laptop, but when I use the AirPower Wireless MIDI I hardwired inside the Vortex, the pads don’t do anything. When I try to set it up wirelessly (selecting zTar for input and output in MIDI settings), the pads aren’t responding correctly to the MIDI mapping. When I press the first pad to assign it to enable track 1 in Ableton, Ableton thinks I’m turning the pitch bend wheel (shows up as Pitchbend in the MIDI map). The rest of the pads come up as CC2, CC3, CC4, etc. They should be coming up in the MIDI map as Note C1, Note C#1, Note D1, etc. as they do when mapping the Vortex directly with a USB cable. Any ideas? Hint: Ableton thinking that it is receiving a Pitchbend message usually indicates that it is receiving a ProgramChange message. As for the others (CC2 etc) I don’t know. Looks like using your Airpower loads a different Patch on the Vortex or something. Check with “Midi Monitor” (Mac) or the equivalent Windows program (MidiOx if I remember). Looks like you wireless if chewing what the pads are sending. Are Notes from the keyboard sent OK? Notes are ok. It plays the track I enable perfectly. What should I set the Vortex to if not Program Change? Ableton does not understand ProgramChange. Usually, I use the pads to send NoteOn with a different note for each function that I want to activate in Ableton. I use the lowest notes (like C0,C0#, etc) or the highest (around C8) that I don’t use in my tune, of course. I then Midi-map those in Ableton. You can also use different ControlChange (CC). Just don’t use ProgramChange! That did it! Thanks so much for the help and for this guide and forum! Now I’m trying to use both of my Vortexes simultaneously with Ableton Live, but MIDI Preferences only recognizes one of the AirPower wireless MIDIs so I can’t map the second one. At this point, it recognizes that there is data coming in (the yellow MIDI signal turns on and off when playing the keys), but there is no sound coming out of Ableton when playing the second Vortex (but I do have full functionality with the initial Vortex I set up). Ever had this situation? Can you tell the seoncd AirPower to use a different Midi Channel (or the second Vortex)? Have you discovered the issue of Sticky Aftertouch? It was a problem with the first Vortex I had, and is still an issue in the new one (got the Wireless). I was wondering if you had this issue, and if so, have you managed some means of dealing with it (other than sending another blast of AT to the synth)? And BTW: I have a Nektar Panorama P6 ( a far more advanced and expensive controller) that exhibits the same behavior. So, any insight you might have would likely be doubly helpful. I’ve had some problem with AfterTouch in the past. Many controllers, and the Vortex in particular, send repeating AfterTouch using Running Status. This way, the instrument will send the first message (like NoteOn or AfterTouch) using 2 or 3 bytes. But IF the previous message has the same Status Byte (the first byte of a two or three byte message), the instrument will only send the message without the first byte. You understand that this can save a lot of Midi traffic, especially with commands like AfterTouch and PitchBend. This is all well defined in the Midi documentation, and most of the time it is well implemented on various instruments. Problems arise if the receiving instrument, synththesizer or computer has trouble keeping track of the Status byte. This happens more often with AfterTouch because it is a two byte message to start with. If Running Status kicks in (and it does most of the time), the next messages will only be one byte long. I had trouble with a DIY Midi controller because the library had a bug (fixed now) but I have also seen sotware on a Mac that had issues with one byte long Running Status messages. One solution is to deactivate Midi Running Status on the instrument. This is not an option on the Vortex. I have asked Alesis and they has confirmed that you cannot deactivate the running status on the Vortex. 1- What platform (Mac or Windows)(I can’t help with Linux…)? 2- What software are you using (All of them, including Midi converters, DAW, etc)? 3- What hardware are you using (Computer, Midi/Audio interface, etc)? I will try to find a solution based on your responses. 2- I toggle between (depending on need) Cubase 7.5 and Ableton Live Suite 9, all running a laundry list of VSTi’s (including Musiclab RealLPC and Real Guitar, which can be a massive pain in the testies with this AT issue), whilst most often using a combination of loopMIDI v1.0.5 (15) and MIDI-OX 7.0.2.372 32bit. 3- I’m running all of this on a ADK re-branded Clevo with a Core i7 4700MQ @2.4GHz (Haswell) , 8gb ram (Samsung), two Samsung EVO Pros 2.5 (250gb each) and a 128gb mSATA (Crucial, if memory serves me). Audio interfaces (three different, depending): M-Audio Profire 610, M-audio Micro USB, and (most often when playing out live) the on-board Realtek with ASIO4All because it’s an easy way to get 8 individual channels out, and it actually sounds pretty freakin’ decent. As a side note: I currently use three controllers that use Aftertouch. The Vortex, the Panorama P6, and The Arturia Analog Experience 61 (apparently manufactured by CME of all people). The Arturia is the only one that DOESN’T exhibit this behavior. Hope this gives you enough info to work with. Actually Johnny, I found I could use multiple instruments on Ableton live simply by making sure they were both active on Ableton Live, using two different midi channels for each instrument, and then changing the monitor setting on the secondary instrument from “Auto” or “Off” to “In”. Try pressing the “In” button and see what happens. If it doesn’t work for the secondary Vortex, try doing this for the first. And by midi channels I mean the actual line on the mixer board, not the channel options below the words “Midi From”. Make sure that each Vortex is selected separately below the words “Midi From” though. If done correctly, I believe it should work. I should have clarified that it has to do with using two Vortexes wirelessly through the Air Power wireless MIDI. I was able to get Ableton to recognize each Vortex separately when connected directly with USB, but it I couldn’t get each one on a separate MIDI channel. Alesis tried to help me…even had remote control of my Mac. Starr Labs didn’t know what’s going on either, except that maybe since I have the Air Power 1, which is no longer supported by Starr Labs, there might be something there preventing Ableton from recognizing both Air Powers. Not saying it can’t be done, but nobody out there seems to have two Vortexes to show that it’s possible. Nonetheless, I’ve given up on that tactic…my lead singer didn’t like it that she had to hear the keytars in her in ears (because the track was coming from the same laptop) and anyway, I want to be able to see what patch is selected (with my iPod touch solution). Hey everybody…I’ve rigged my Vortex up as an iPod/iPhone dock and hardwired a Sennheiser wireless transmitter inside (to replace my former AirPower wireless MIDI setup). I had to remove the drum pads to make room for everything–everything else still works. The only exception is that now the ribbon controller r1 CC is controlling volume instead of modulation. Is there a way to change what operation CC does? Thanks! By the way—this is the way the Vortex SHOULD have been set up in the first place—forget wireless MIDI with Ableton—mobile app developers should be working on creating better sound bank options than Sampletank…. Vyzex vortex software lets you change what cc the ribbon controls. Just change it to the proper cc # there and you should be good to go. That’s very easy Johny. If you’re using Ableton Live simply press the “midi” button up in the right hand corner, select which control you want to assign, and then tweak the ribbon controller on the Vortex. I’m not using Ableton…I’m using Sampletank on an iPod touch. Isn’t there a way to do it on the keytar itself? Press Patch Edit-> touch the ribbon (rib is displayed)-> press ribbon mode 1-> press MODE ASSIGN-> select CC-> press ENTER-> press Patch Edit. That did it…couldn’t figure out how to do it in the Vyzex software. Read all the comments, questions, this whole thing. Learning as I go. Purchased Vortex wireless to use onstage. Midi’d to the Korg PA80 we use onstage. I use eight voices from the Korg, and have been just getting to them from the UP/Down Program keys. Takes too long when one voice is at 114 and the next one at 30. I dont have a clue about programming, midi – I’m just a player. Alesis manual is bewildering to someone like me. Would like to be able to push Pad 1 for my guitar sound, then Pad 2 for my organ sound, etc. Does anybody have any step by step instructions withOUT connecting this thing to a computer to do what I want? If it was in any of the stuff I just read, I must’ve missed it. I glazed over pretty quick I think. Any help would be soooooo appreciated. If you don’t edit one parameter type, it will retain the previous value (which you have no way of knowing, by the way)(unless you use MidiMonitor on the Mac or MidiOx on the PC). The display will show its number (like “Pd1?). I followed your instructions to the letter and successfully programmed my electric guitar sound from the Korg PA80 to pad 1! I then attempted to program a steel guitar sound to Pad 2, following the exact same instructions, and then an organ sound to pad 3. When you hit pad 2, the vortex number value changes to the correct number for the steel, but the sound remains the electric guitar. Same for pad 3: the vortex changes the number to 16, which is the number assigned to the Korg’s organ, but the sound that comes out is the electric guitar, so all three pads are that sound. What did I do wrong? Finally, after much ado, I was able to assign the drum pads to the instruments I want to play live during our gigs. Thank you, oh wonderful guru man. Everything is GOOD now, and I appreciate the time you spent answering my question. Glad I could help! Have fun! When in “upper” mode on the Vortex (and therefore sending on midi channel 2) the ribbon no longer works as it normally does (modulation). Is this the way it is supposed to work on the Vortex? Does the ribbon only transmit on channel 1? The channel used by the button does not change when you change Keyboard channel. The channel assigned to the button can be changed right after entering Patch Edit Mode. Just press the Midi Channel key on the keyboard and use the numeric keys (1-9 and zero on the keyboard) to set the channel. Yes, redundantly, you can also change the channel by turning knob K1, but only for modes PB and AF. I used the Keytar just for performances connected wireless with a Kronos 2. I used (Upper) default channel 1 and (Lower) midi channel 2. How to assign a volume control for a different midi channel ? When I press (Lower) Vortex changed the midi channel to 2 and my Kronos responded without any problem except the volume. If there is another way to changed midi channels/volume etc… using my left hand I will appreciated. Jose, not without loosing some other fucntionality (a limit of the slider. The programmer forgot about this…). For example, you could use the ribbon for volume control. Of course, you could use one of the knobs, but you mentioned that you preferred left hand access. Thanks for your fast response, but my major concern is when I change midi channel (Lower )in this case to channel 2, I need the volume slider respond to channel 2, then when press channel 1 (Upper) volume slider respond to midi channel 1. In short, I need to control the Volume in the Keytar no matter what midi channel I’m using. When you switch from upper to lower, is it to choose a different sound on the Kronos? If so, you might want to use a Midi Program Change instead. Then you could use only one channel. You could program a Pad to send the Program Change command to the Kronos (and of course a second Pad to send the PC to get the original sound back!). The Kronos would then react to the slider on channel 1 (default). If you want to use the Upper/Lower to actually split the keyboard, you are out of luck. The Vortex only uses one channel for that slider. One thing I don’t know: since the slider sends CC7, Master Volume (and not Channel volume) why isn’t the Kronos responding to that? It might be in your documentation. RT…I will try to use the pads insted and edit patches to change midi channel with volume. I used the Kronos in Combi Mode, Midi 1 for the Kronos Keybed, Midi 2 & 3 are for the Keytar, Midi 7 for an Analog synth and Midi 16 for the Novation Sl MkII 61. I am new to the midi controller world and just got a vortex. I just can’t figure out how to send control messages to ableton. I want to have 2 or 3 different instruments that I can change between from the vortex. I assume this would be a patch change, but maybe it would be a program change. How can I tell Ableton to change to a different instrument? How do I set up Ableton to have different instruments loaded? Do I load each instrument into a midi channel? I am using Windows 7. Any help would be great. Summary is: send a Control Change (or even a simple Note On) that will launch an empty clip in an instrument track. Ableton responds very well to CC commands. Each instrument is installed in a separate track, without the need to play with channels. You could even attach the “record” button of each track to a different CC. Can I connect alesis vortex to yamaha PSR S950? if it’s possible, can I get all the voices in vortex from yamaha? If I select a voice in yamaha, can I play the same voice in vortex without the help of PC or any Vortex Editor software? The PSR-950 will respond to MIDI commands from the Vortex directly. The sound will come from the PSR, of course, since the Vortex doesn’t make any sound. Your guide is a godsend! Though I still can’t figure out how to change anything using the vyzex while editing patches right from the Vortex itself works just fine. I’m using a Win10 laptop. I also play wind controllers with 5 pin midi out and they power my Bluetooth LE dongle but the Alesis Vortex Wireless is not powering the device when I plug it in. Anybody know if the midi 5 pin out is supposed to be sending voltage? The Vortex does not have voltage on pin 5. Thanks for the answer, just wanted to make sure. Don’t really need wireless midi via bluetooth le as the built in wireless midi should be much better. I never relied on bluetooth le for a gig but I will with the built in wireless. I had the camera connector already so using the usb dongle works for me for both iOS and Mac. I only found an “open box” Vortex Wireless and all the new keytars are on back order. Are they coming out with new models or discontinuing keytars? You could also do a little converter yourself if you’re into electronics. A simple Arduino and a shield from Sparkfun, with a simple program, would do it for less money than the Bome box. Let me know if you need help with this. I have same question, forget all the technical terminologies, can u help with this? I m performing a song, there is flute in intro, piano in verse, violin in middle and guitar in end. Can i have them all with a single touch using the pads?? FYI im using Reaper and Nexus as my Vsti. i think that the only way is to have a button with a program change for each different sound. Having a single button might cause sequence errors, especially during live play, by pressing twice on the button instead of only once.